When you create a new design, it’s automatically assigned a unique name Wireframe and is visible to all project members. You can change these default values as well as add a description and assign a template by editing its properties. All project pages are displayed in an interactive site map. The design thumbnails are displayed in the Page Designs pane below the site map. 3. Select a design thumbnail. 4. Edit the design properties. Name – Choose a name that’s meaningful to Reviewers and other users. The name appears under the design thumbnail in the filmstrip. Visibility – A visible design is accessible by all users. 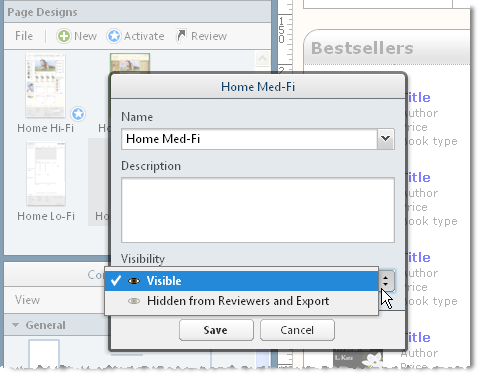 You can change the default visibility to hide designs from Reviewers and prevent them from being exported. Description – Specify a description of the design. Only users with Developer privileges or better can view this information. The Design Properties dialog is shown below.